Murder! is a 1930 British drama film co-written and directed by Alfred Hitchcock and starring Herbert Marshall, Norah Baring and Edward Chapman. Written by Hitchcock, his wife Alma Reville and Walter C. Mycroft, it is based on a novel and play called Enter Sir John by Clemence Dane and Helen Simpson. It was Hitchcock's third all-talkie film, after Blackmail and Juno and the Paycock. In 1930, Diana Baring (Norah Baring), a young actress in a travelling theatre troupe, is found in a daze with blood on her clothes, standing by the murdered body of another young actress, Edna Druce. The poker used to commit the murder was at Diana's feet, but she has no memory of what happened during the minutes the crime was committed. The two young women were thought to have been rivals, and the police arrest her. Diana withholds some important information deliberately, to protect something about the identity of a man that she will not name. A jó nevű színészt felkérik, hogy esküdtként vegyen részt a bíróság munkájában. A gyilkossági per vádlottja egy fiatal színésznő, akinek ártatlanságáról az esküdt szentül meg van győződve, ezért minden eszközzel megkísérli megmenteni a lány életét. A lányét, aki tehát ugyanabban a szakmában dolgozik és persze igen csinos. Click the button below to add the Murder! 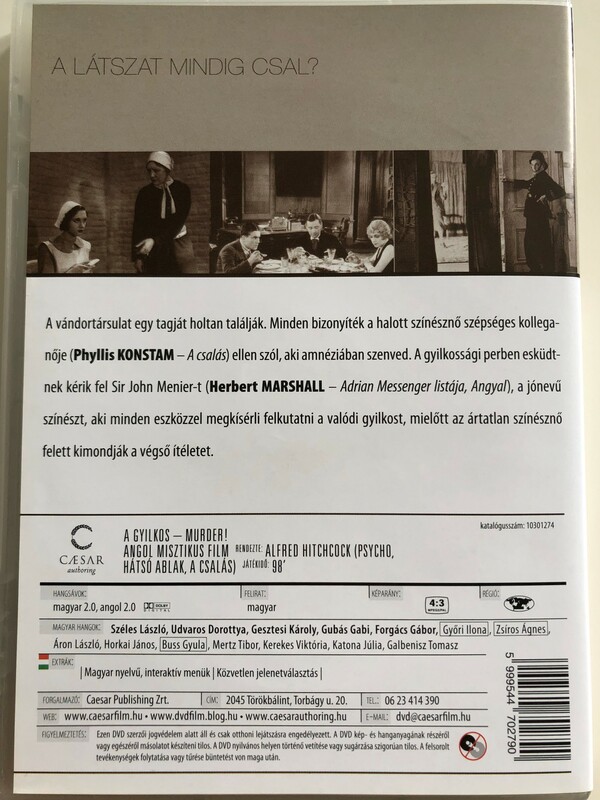 DVD 1930 A gyilkos / Directed by Alfred Hitchcock / Starring: Phyllis Konstam, Herbert Marshall Norah Baring / B&W Hitchcock Classic to your wish list.